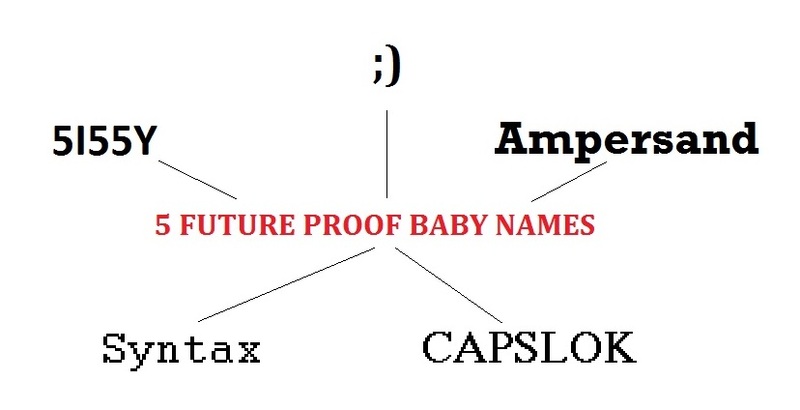 Hashtag is no match for these 5 most popular names of 2035! Our due date is less than 3 weeks away. (Personally, I think it’s less than 7 days away…) The nickname Smushie is cute enough for us, but we have to christen the new addition with a more official name, otherwise she will become property of the hospital. Since we’ve got no shortage of chores around the house to do, we see more value in bringing said baby home to unwittingly work for us in exchange for providing her food and shelter. B) are too young to use a cellphone. In a nutshell, hashtag is a Twitter tool for twits that tweet. All the hip dudes and dudettes are using it. (Obviously, not me.) Just like the @ symbol is used in email, # is the tag symbol used in Twitter. Sort of. Enough said about that, I’m boring myself to sleep thinking about it. The name Hashtag has been given to a little baby girl by a family only known as the Jamesons (whose brains may have been soaked too long in whiskey bearing the same moniker). I guess that makes Hashtag effeminate…I don’t know. But if you’re the first person to name your child after a computer symbol, it’s only fitting that you should be able to select which gender the name belongs. In this day and age of technology, I’m an abacus. I began to ponder what it will be like when Smush goes to school and all of her friends have cool, new millennium names. I couldn’t let my daughter have a primitive name like her parents. I won’t let Hashtag be the coolest, most popular kid in school! I know I can do “one better” than the name hashtag. In fact, I can do 5 better than Hashtag! Syntax – Come on, some idiot genius has got to have thought this would be a cool name! 5i55y – She’s going to be the little sister of Worm, so why not swap some letters for numbers and call her what she is! This is probably my most futuristically clever name yet! 😉 – This could be the most original techno-fied name yet! Semicolon Close Parenthesis is too long…so We’ll call her Winky for short. So there you have it. The wife and I (or maybe just I) have made our new list of future-proof names for our baby girl. Because by the time Smush is ready for grammar school, Emily, Sophia, and Nevaeh are going to sound like a bunch of crotchety, old grandmas. When my baby girl is born, she is going to step straight into the future! Happy New Year!